Tangy mango and passion fruit dipping sauce is great with these rich, coconut-flavored churros. Best served fresh from the pan. 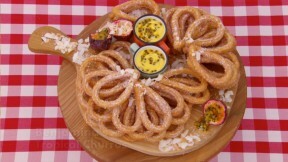 This tropical churro recipe is featured in Season 4, Episode 4. For the dipping sauce, blend the mango and lemon juice to a purée using a food processor. Set a large, heatproof bowl over a pan of gently simmering water. Scrape the seeds and pulp out of the passion fruits and push through a sieve into the bowl. Discard the seeds. Add the mango purée, egg, egg yolk and sugar to the bowl. Stir frequently until the mixture is thick enough to coat the back of a spoon. Remove from the heat and stir in the butter one piece at a time. Set aside to cool. For the churros, in a shallow dish, mix together 30g (1oz) desiccated coconut and 50g (1¾oz) caster sugar. Set aside. Put the remaining 100g (3½oz) desiccated coconut in a spice grinder and blend to a fine powder. Transfer to a frying pan and lightly toast. In a large saucepan, combine 300ml/10fl oz water with the remaining sugar, the milk, salt, butter, vanilla paste, coconut flavoring, if using, and coconut oil. Bring to the boil. In a separate bowl, mix together the flour and toasted coconut. Add this to the boiling sugar mixture and mix well using a wooden spoon until the dough comes together in a ball and pulls away from the sides of the pan. Let the dough cool slightly, then transfer the mixture to a large piping bag fitted with a large star nozzle. Line two large baking trays with greaseproof paper. Pipe 18 churros in teardrop shapes, then cover and chill them for 10 minutes. Remove the churros from the oil using a slotted spoon and drain on a plate lined with kitchen paper. Coat the churros in the coconut and sugar mixture. Serve immediately with the dipping sauce. For this recipe you will need a food processor, a spice grinder and a deep-fat fryer or a suitable pan and a cook's thermometer. Note: This recipe contains U.K. measurements and may require conversions to U.S. measurements. It has also not been professionally tested.